One of my favourite things in life is learning new things. It is when I feel my most alive, when I feel my eyes are widest and the world seems, more amazing somehow. I expect there is a percentage of folks out there to whom things come easily, gifted folks who are “naturals” at certain things. I am not one of them. Learning is rarely straight forward and most times I find myself excited, confused and exhausted all at the same time. I also fail, a lot. I’m not bragging that I’ve gotten things wrong, I certainly never set out with a mindset of anything other than success, it’s just the way I learn best. Over the last four decades I’ve come to accept that this is how things go. I’ll happily tell you I am bound to make every mistake acquiring a new skill might entail, but so long as I am not repeating those mistakes and getting stuck, then in my mind at least, it’s a win. With that in mind, so far in 2017 there has been a lot of learning along side some marginal gains. Our first succession sowing of heirloom and heritage beans are off to an amazing start, the tomatoes are tentatively stretching up out of the seedling soils and the sap collection from our Birch is in the final quarter of what might be the shortest season on record! The same unusually high temperatures that are helping the seedlings yawn to life has also put the bushes and trees into overdrive and “bud burst” is just around the corner. I’m guessing we’ll start seeing leaves in 48 to 72hrs. I love this time of year, the rush of life and sense of urgency in the awakening of things. 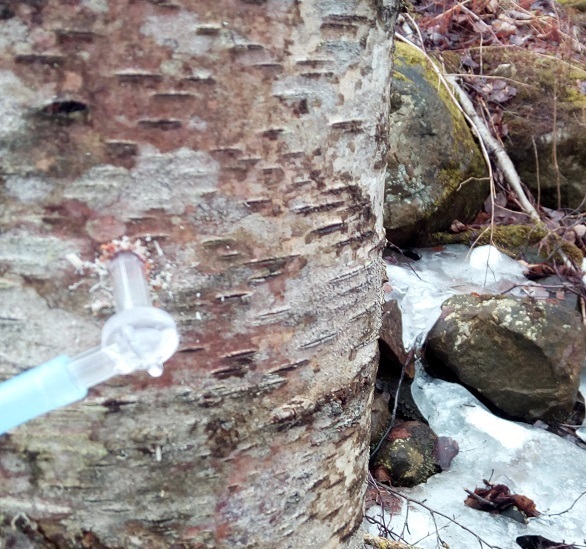 Conversely, it also means our new venture into Birch Syrup is at risk of being cut short this year which will probably mean more trials next year! This entry was posted in blog, featured, foraged foods, garden and tagged #femalefarmer, birch, birch syrup, bjork, bjorksirup, blog, foraged foods, gardening, Norway, organic, tomatoes, wine, working with nature on 1st April 2017 by Garden and Plate. The first day of spring saw us greeting an articulated lorry parked at the base of our drive. We’d not expected it for several more days but were more than happy with it’s early arrival. It was delivering what quite possibly the only Maple Syrup evaporator to ever ship to Norway. As luck would have it our good friend Darren is visiting us from the UK right now. Along with being my other half’s best friend he’s also an engineer so getting to build a thing neither of them had ever seen in real life was exactly the sort of challenge they enjoyed. As you might imagine they managed just fine, and even made sure it was easy to disassemble should the need ever arise. Those of you who are fascinated by trees (like i am) will know of course that the Sugar Maple is not native to Norway and you may also know that the Norwegian Maple does not share the high sugar sap of it’s more famous brethren. We’re actually taping Birch. Birch sap has a sugar content of roughly 1% which is half of that of Sugar Maple. This is the primary reason Maple Syrup is “a thing” whilst Birch is not. More accurately perhaps, it is why Birch was not, it is now. Say what you will about technology and our advancements, it’s because of these specifically of Reverse Osmosis technology that the harvest of Birch Sap for the making of Syrup is now viable. Birch Sap itself has been a popular “crop” in colder climates throughout history, Russians and Estonians used it for the making of beer and spirits, North American native peoples would drink it as a spring tonic. I believe that Norwegian Birch Syrup can become a product that chefs and people who throw dinner parties want in their pantry. I have the same hope for Birch Wine, but I’ve less reservations about that since decent wine sells itself. Only time will tell though, and we’ve a steep learning curve ahead of us! Our production this year is more of a sampling than anything, we’ll be the Norwegian “pioneers” of the product so getting people to try it is a big part of this year’s goal. No one has produced Birch Syrup or Birch wine commercially here and very few people have even done so for themselves. In a way this is fantastic, a wide open opportunity and people appear to be curious. Fingers crossed! This season we will harvest Birch Sap from 60 trees in out “home pasture” This should mean approximately 500 litres of sap which we’ll then use for syrup and wine to trial as products. I’ve had Birch Syrup from Kahiltna Birchworks the Alaskan Birch Syrup pioneers and Birch Wine from the lovely folks at Organic Lea and know that making an excellent product is possible, it’s just the learning curve to get there! I’m confident I can make the wine, I’ve a few years of successful wild wine under my belt it’s learning to use the evaporator that may be tricky. Anyhow, it’s warmed up to +7 so it’s time I go collect the sap! 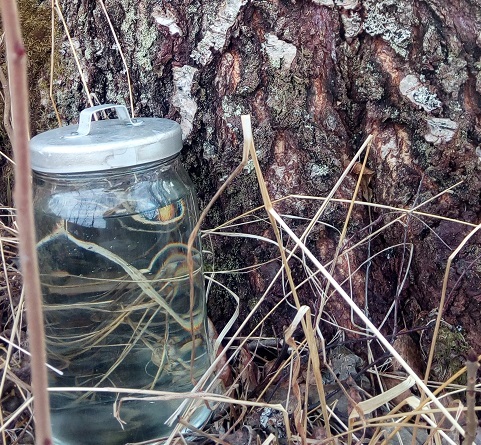 This entry was posted in blog, featured, foraged foods and tagged #femalefarmer, birch, birch syrup, bjork, bjorksirup, jacqui shannon, Norway, organic, telemark, wine, working with nature on 24th March 2017 by Garden and Plate. As I am writing this the snow has just taken a break from slowly falling for the third day in a row. It’s not been falling hard, it’s not been a blizzard but it’s still crazy dangerous out there and we are on a self imposed lock down. Winter has been strange thus far. We’ve had heavy snow and freezing cold as well as entire days where the thermometer is in the plus. That’s how it is now. There was a time, when I lived in the relative flat land of London UK when a sudden warm spell in the winter would be very much welcomed. Now that we are living on what is essentially the side of a mountain the warm spell is just dangerous. The melt is going to freeze up, like it had done several times already this winter, and we’ll be in the middle of an ice field on a significant slope. The first time this happened we had left the truck beside the house and when we tried to move it we got maybe 25m (75 feet) before the truck started sliding sideways. If you have ever been in a vehicle on ice you’ll know how scary that can be. We even had the chains / spikes on the truck’s wheels, it didn’t matter, gravity and ice won and we slid straight into the forklift forks. It could have been worse, if we’d lost momentum just a few meters further we’d have taken out the boat and trailer.. that would have been really bad. Suffice to say, ice fields mean we stay hunkered down. Even getting out to the barn twice a day is a challenge. Being inside has it’s perks though. I’ve taken to teaching myself some new skills one of which is learning to cultivate a wild yeast sourdough starter for bread making. Making our lives, and in particular our food systems as self sufficient as possible is very important to me. I don’t believe we will ever be one hundred percent self sufficient, primarily because there are things I can’t grow (like coffee) or won’t grow (like tobacco) here. That’s ok by me. My personal goal isn’t to be completely and solely self reliant, it is to run a healthy chemical free ecosystem that provides most of what we eat and need to live comfortably. That includes generation of a modest income, which i believe everyone needs these days and also actively improving the land for the next generation of our family. 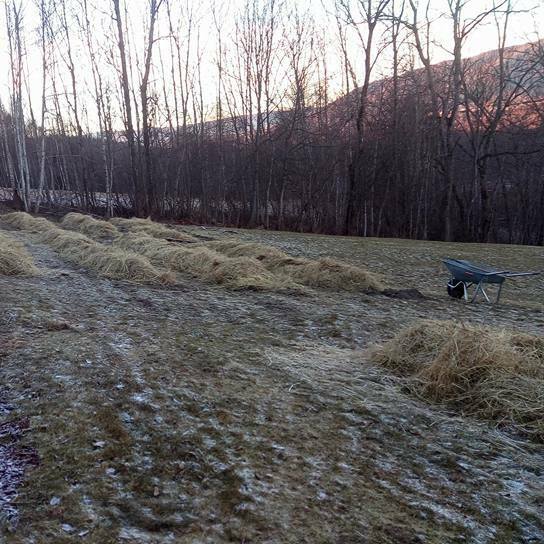 This entry was posted in blog, featured and tagged #femalefarmer, bread, jacqui shannon, organic, smabruk, sourdough, telemark, winter, working with nature on 3rd February 2017 by Garden and Plate. In the last post I mentioned the term “closed loop” in referring to how I would like our farm to run. A closed loop system is one that is self sustaining, ie nothing needs to be brought in from the outside in order for it to continue. This self perpetuation is the same principle people often refer to as “self sufficiency” and you can find versions of it in use in places that practice permaculture, in forest gardening and many organic farms. Nature itself is a closed loop. She needs nothing from us to go on being self sufficient. Unfortunately, we humans usually need and want elements in addition to what is naturally occurring. To meet our own needs initial investment or installation of outside elements is necessary. For us, that means vegetable beds, chickens, turkey, bees and eventually a micro flock of sheep. Although the addition of a these elements may not sound so large a change, they are. Fortunately by doing each step slowly and in turn and with some forethought it is possible to make each addition into a closed loop so that after the initial investment the cost is one of labor. Even the addition of vegetable beds impacts the land. Everything we grow does so by withdrawing of nutrients from the soil. It is not enough to simply decide to grow your own food. While doing so is good, it’s not self sufficiency. To be self sufficient you must at the very least consider and replenish those lost nutrients. Best practice in this would be to aim to input more nutrient and organic matter into your growing beds than you take out. Doing so would increase on the soil life incrementally each year so that ultimately the land is healthier year on year. Makes sense, right? I think so. In our case we began the replenishing cycle this autumn before the veg beds had even been dug or the first seeds even planted. In fact, my very first project here when I arrived in October was the construction of a pair of compost bins and a leaf litter pile. Composting on site is an easy first step to creating a closed loop for vegetable production. Leaf litter piles, which eventually rot down to what is refereed to as “leaf mold” is an excellent addition to soil for the retention of moisture. Our land is sandy loam, with a higher percentage of sand than loam, so anything we can do to promote retention of water for our growing veg is worthwhile. One of the helpers I will be introducing into the farm life cycle will be the perennial Bocking 14 Comfrey a well known plant famed for it’s fertilizing properties in the organic world. Comfrey is such an important player in the plans for our farm that I’m going to write an in depth piece on it this year, but I digress. Creating a closed loop for the vegetable production is essentially as simple as ensuring all of our vegetative growth from grass clippings and twigs to weeds and eventually the plants themselves gets recycled via compost. In the spirit of returning back more to the soil than what we have taken out, we will be adding Comfrey leaves, nettles and leaf moud. Overtime this cycle increases the fertility of our land, which increases it’s productivity allowing not only us to thrive but for the farm itself to do so as an ecosystem. Happily the closed loop system can be implemented with our livestock and to most every aspect of our food system on the farm. This entry was posted in blog, featured, garden, Uncategorised and tagged #femalefarmer, blog, featured, fertilizer, Norway, organic, organic gardening, working with nature on 28th January 2017 by Garden and Plate. The snow is blanketing the slopes and the clouds in the valley are hanging at what seems to be just above head height from my chair. I’ve made my first stock of the year from vegetable peelings and chicken bones, and I’m planning that by the end of the year this simple healthy base food will be all part of a closed loop system here on the farm. Our goals for this year include raising chickens for meat and eggs, keeping turkeys, growing 50% of our own vegetables and establishing a herb bed. These may seem like the goals of an underachiever to some, I’ll freely admit that my natural inclination is to declare my intent to do “everything” but to make things easier for my other-half I’ve promised to understate my ambitions everywhere including here. It’s not natural for me, but hey, it can’t hurt! In order to facilitate our plans for 2017 we have been doing some solid ground work. He has been building me a glasshouse from scratch. It’s a time consuming process. Getting the “free” windows was the easy bit. Since then, he’s scraped them all, re-puttied the seals, cut and hauled trees from our wood, milled wood to spec, built walls in sections, oiled, primed them and begun the gables. This week he hauled the second load of logs to our mill, it took 3 straight days. They are very big logs and among other projects they will also be the main frame for the glasshouse. At just under 50 square meters the glasshouse is going to be bigger than our cabin. He’s put in a lot of work to help ensure our growing has every advantage possible. To compliment the glasshouse I’ve dug and mulched 10 out door beds, which will be our “kitchen garden” at 10m x 1.25m they give us approximately 125 square meters of growing space for the semi-hardy and hardy vegetables that will make up the bulk of our diet. I’ll tell you what, after three months of eating shop bought and mostly non-organic vegetables I am really excited to get back to eating food we know the sources of. Come on Spring! Our cat who also made the journey to our new home in Norway. He’s settling in now and likes to ensure he knows what’s going on. 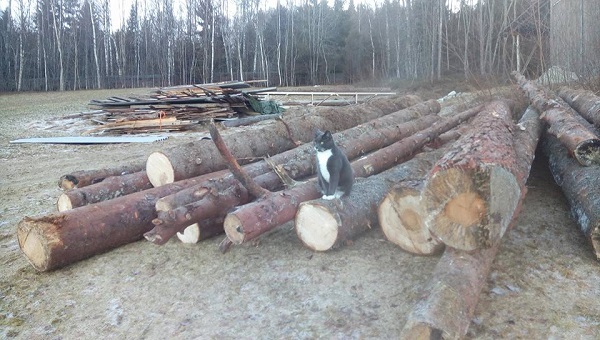 Here, he is “owning” the logs that are going to be milled this spring. 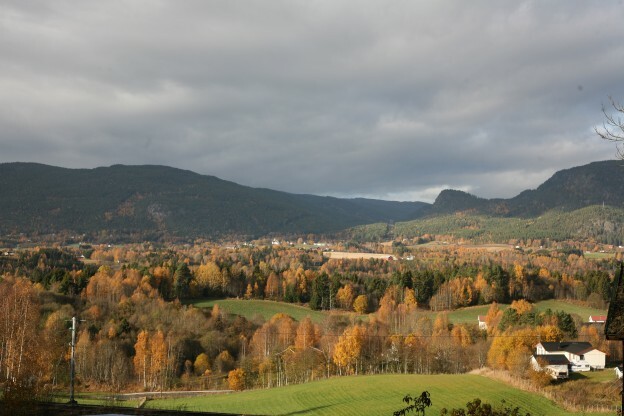 This entry was posted in blog, garden and tagged #femalefarmer, blog, jacqui shannon, Norway, organic gardening, smabruk, spring, telemark, working with nature on 7th January 2017 by Garden and Plate. It’s 8am and the sun is just beginning to peak over the far slope of the valley. The Norwegian has been in the barn for just over an hour and has been back to the house to ask me to come see the progress of “my” task for the day which he has had to take over. I’ve spent the last two days raking the abundance of Ash leaves into piles. There’s still a lot of Birch leaves I want to collect as well. I’m thinking ahead, as farmers must, about the soil’s future health. You can call yourself any sort of farmer you want, but in the end, long term sustainable success means we are all the same. We are all soil builders. For us, that means taking advantage of the gifts mother nature gives us in the Autumn. 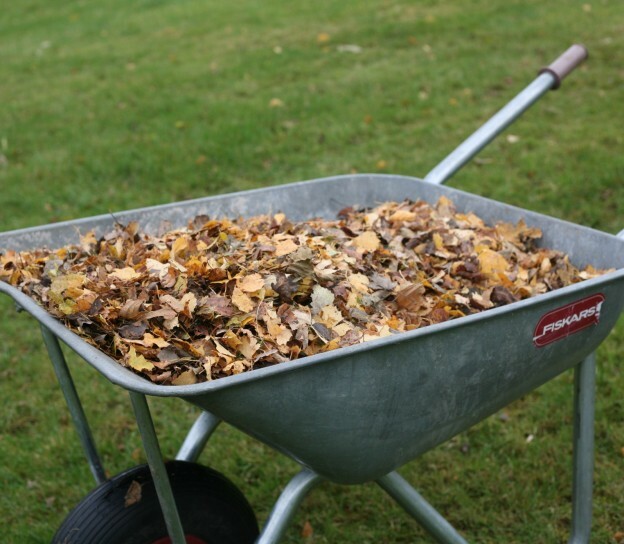 Mulch, compost and leaf mold feature heavily in my plans this week. The leaves have immediate, short term and long term benefit: mulching around our currant bushes will help them this winter, adding leaves to the compost is helping build critical mass needed for active winter composting and the leaf mold bins will help us create more friable soil in two years time when it’s broken down. It’s three gifts in one and I want them all. Unfortunately, three weeks ago I played “hero” on the river and stopped a 60 ft steel narrow boat free floating down the river in flood. This resulted in me tearing the muscles in my back on both sides. It laid me out completely for a week. The doctor wrote me off for 6 weeks upon seeing me. Life doesn’t stop however, and I moved to the farm just 72hrs ago. Suffice to say, 52kgs of luggage and a cat did my recovery no good! I honestly thought raking leaves was an easy enough task. Perhaps it was. Bending down to cut the hardware cloth to make a leaf cage was too much, so I’ve been sent to the cabin to rest. I don’t think he minds, but I think he’s worried that I may not recover. To ruin my health just at the beginning of this great adventure would be devastating. I’m trying not to think about that. I hate feeling I’m not pulling my weight, but he is right, there is only one way to recover; rest. This entry was posted in blog, featured, garden and tagged #farm, #femalefarmer, fertilizer, jacqui shannon, working with nature on 29th October 2016 by Garden and Plate. Salad, it ain’t what it used to be! This year I planted specifically with a view to have fresh green salad to hand. It might sound like the move of someone who isn’t quite sure about gardening, but for me, it was a first. I love the modern version of salad that I have come to learn in the past two years but still harbor strong unpleasant feelings toward its 80s incarnations. Planting salad for the 2016 season was in a way an effort to purge the negative feelings toward something that may just become an important aspect of my future. It wasn’t until my twenties that I started to voluntarily eat salad. “Rocket” had just become the new fashionable thing in Toronto usually accompanied by avocado, tomato and either mozzarella or feta. Until then, my only engagement with salad was the lackluster iceberg, cucumber tomato trilogy my mother put on the table whenever she was on a new diet. It’s not her fault, a whole generation made salad this way. Back then, if anyone had told me I was purposely going to plant myself a salad garden, I would have scoffed. It’s the first week of summer and I have harvested my first proper salad meal. Over the past two years I have really had my eyes and my taste buds opened to the magic that can be in a bowl of greens. I am grateful. Early in my journey when Ru Litherland first suggested that our smallholding consider salad as a cash crop I had serious prejudice. My mind still holds the bland and boring salads of my youth as it’s go to image of what a salad “is”. But today, when i sat down to eat my lunch and the beauty of what was on my plate began to sink in I gave the idea it’s first serious consideration. Salad, as a revenue stream has a lot of positive things going for it. It grows quickly, can be done early in a glass house and later in the field, luxurious versions can a relatively profitable. It’s also something I have a lot of harvesting experience with, which is another key consideration. The banal bowl of my childhood has been replaced by a colorful, fragrant, multi flavored, visually enticing ever changing and exciting mix of herbs, leaves, and flowers. For me there is something decidedly decadent about eating flowers. For starters, it wasn’t something I knew you could do until I started my apprenticeship, and I am not alone. I have to admit, not all of them taste of much, regardless, the fact that they’re there in all their esthetic splendor adds to the enjoyment of eating. Recently, I’ve been contemplating how the land will generate the capital we will need going forward. Luckily we don’t need much. Salad, might just be the trick.. or one of them. 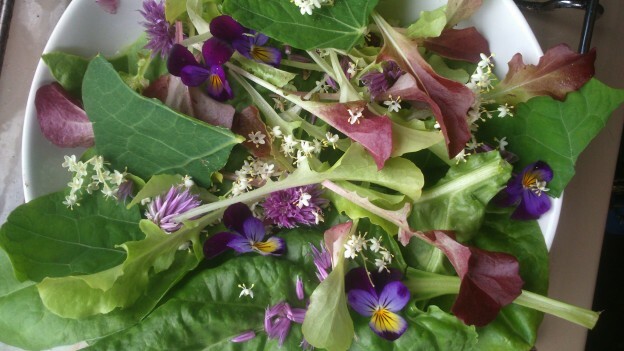 Today’s salad: Beet leaf, Nasturtium leaf, CCA lettuce, garlic chive flowers, Viola Tri-color and foraged Elderflower. This entry was posted in featured, garden and tagged foraged foods, organic gardening, spring, successional planting, working with nature on 3rd June 2016 by Garden and Plate. Spring is beginning to raise its beautiful green head above the parapet and with it our green fingers begin to itch to get in the soil. Winter time is a great time to plan your next gardening adventures and in case you have a wee bit more room in your beds, I’m going to sing the praises of Jerusalem Artichokes. They’re Beautiful. Even someone as dedicated to the mantra of “everything must first be edible and useful” will admit, it is difficult not to smile when the sunny yellow heads of this Sunflower relative are in bloom. Protection and improvement of cropping. Standing at up to 2m tall Jeruselums make an excellent semipermeable wind break for your less wind tolerant crops. Planting these in a row on the winds prevailing side can shelter more delicate crops and help increase yield. Crop well with little fuss. Every gardener needs a crop that is less fussy and provides abundance whilst being low maintenance. These guys are it. Easy to harvest. Once the tops begin to turn golden and the bite is in the air all you need is a fork to lift the lovely tuber and brush off excess mud. Grade A hotels. Once harvested the stems of the plant should be left in situ. Their hollow stems make great over wintering “hotels” for our beneficial insect friends. This gives your garden a head start in the spring as your good guys are in the correct geographical region to nip out any of the bad guys who have overwintered in your soil. After the risk of frost has passed, the insects will have moved out of the stems, the stems can then be added as an excellent carbonaceous element to your compost pile, completing the circle. 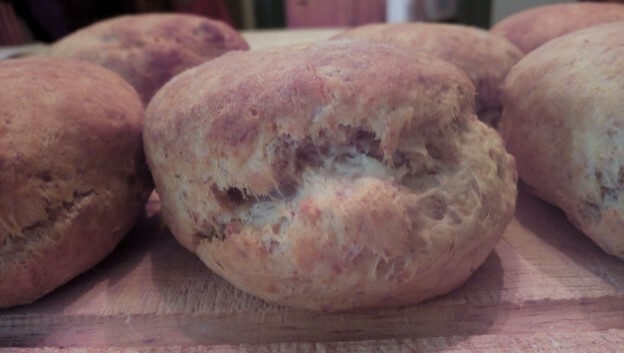 An excellent alternative starch. Jerusalem Artichokes are very versatile in the kitchen and their lightly nutty taste is quite a winner. They can be grated raw as part of salad, sliced and lightly steamed to add crunchy to a stir fry, pureed or scrubbed and roasted with rosemary and sea salt as an attractive side. Some people do experience wind with eating them, so it is best to eat small amounts at any one time. This entry was posted in blog, featured, garden and tagged gardening, jacqui shannon, urban garden, working with nature on 14th February 2016 by Garden and Plate. Here in the United Kingdom Rhubarb enjoys a rather prestigious place in the culinary calendar. The pale pink slender stems of “Champagne Rhubarb” are both the ushers of spring and the first reliable cash crop of the year. No matter how much is grown at Organic Lea, the demand far outstrips the supply our mere 2 acres of diverse intensive farming can produce. Champagne Rhubarb production is lucrative, but it can also be relatively expensive as the crop is grown in heated forcing sheds. Currently, nine square miles of West Yorkshire, is known as “The Rhubarb Triangle” and encompasses twelve farms. In 2010 these farmers approached the European Commission’s Protected Food Name scheme and were awarded Protected Designation of Origin status (PDO) for the term, “Yorkshire forced rhubarb.” Forcing Rhubarb is big business for some, however it can be done with some success in a low tech way small scale using your netting wires and a blackout cloth. For many growers, Rhubarb is planted once. It’s widely accepted that some vegetables like Rhubarb, Asparagus and Jerusalem Artichoke, stay put when planted and remain indefinitely. Many successful allotments and growers subscribe to this thinking and harvest successfully year on year. Organic Lea is committed to using two of it’s acres to intensive organic farming and rotation is a key element in keeping both plants and soil healthy. This means that even crops that traditionally stay “forever” in one place are included in rotation, albeit for these crops they move once every four years. 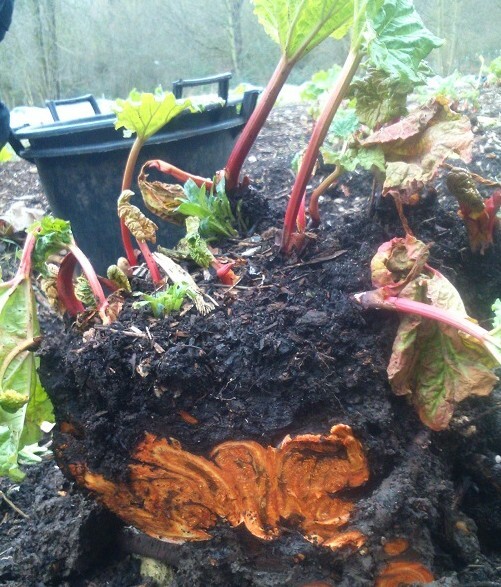 This is year four for our early Rhubarb crop and the first year of it’s rotation, so this week we uprooted one of the four rows of Timperley Early and began the process of splitting and moving it to the area of the farm called The West Bank, or Salad Terrace. Over the years, the team have noticed that the Salad Terrace is the coldest plot on the farm. It is also the most over run with Horsetail. The thinking is, that Timperly Early will not suffer from the slightly colder micro climate and that with it’s maturity it’s wide leaves may also slow the rampant encroachment of one of the world’s oldest known “weeds.” Both of these factors have inhibited the Asparagus from reaching it’s full potential so we are effectively preforming an experimental swap of the two. Splitting the Rhubarb serves two purposes, the first and most obvious is propagation. Mature crowns are quite easily split to produce multiple plants. To do this effectively one only need ensure each split contains both root and bud, we leave two to three buds in a spit. The second reason for splitting is to cut away the heart. This may seem counter-intuitive, however the older a plant is, the more susceptible it becomes to disease. By lifting and splitting the crowns and cutting out the old growth we are taking preventative measures against potential disease in the crop. The oldest part, or heart then is added to our compost completing its circle. This entry was posted in blog, garden and tagged gardening, jacqui shannon, organic gardening, urban garden on 5th February 2016 by Garden and Plate. Before the ground freezes, and after the stocks have turned crunchy and golden is the time lift and store our Jerusalem Artichoke tubers. These starchy little wonders will liven up your meals through the dark days of January and February as well as add an element of beauty during the growing season, but you already know that if your now reading about how to save the tubers for next season! Similar to what we look for when harvesting Garlic for seed, you are again looking to save and replant prime specimens. Those that we plant should be those with the positive traits we want to encourage in order to improve our seed stock and harvest year on year. With Jerusalem Artichoke, this means setting aside those golfball size tubers, that are knob and blemish free. The should not show any sign of blight, insect damage or disease. One you’ve set aside your seed stock you’ll need to store it before it’s time to go in the ground again. Always try and store a small percentage more than you think you are likely to need as with planting there will always be the chance of failure in a few. For the best chance of a successful storage, you’ll want a container big enough so you can layer the tubers in without them touching each other. I begin with a layer of moist coir approximately 3cm thick and position my first layer of tubers being careful to ensure a good amount of room around them so that they are not going to shift and touch each other. This is very important. 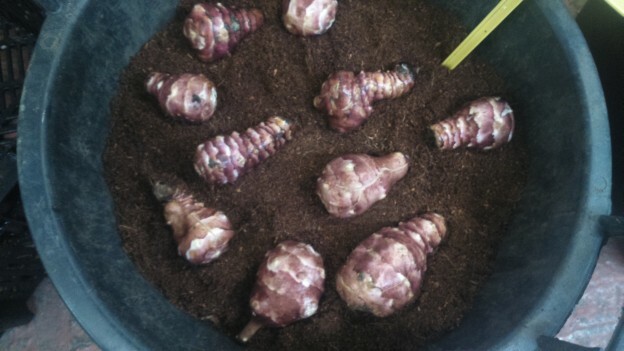 By isolating each tuber you are minimizing the risk of contamination. A rotting tuber which contacts another with expedite the rotting process in the next. After the first layer I cover it with a thick layer of coir, approximately another 3cm to avoid vertical contact between the layers. This process is repeated until all the seed tubers are bedded into and covered with coir. The whole bucket then sits in the ambient storage until planting begins again in spring. 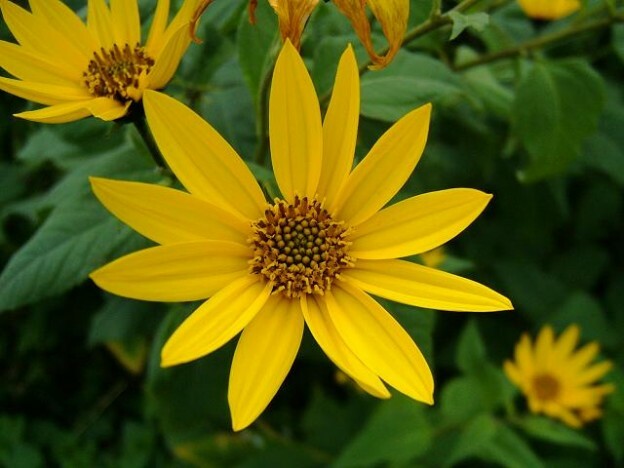 This entry was posted in blog, featured, garden and tagged gardening, jacqui shannon, jerusalem artichoke, organic, organic gardening, urban garden, working with nature on 20th January 2016 by Garden and Plate.